Research has proven that matching your personality to a career brings work satisfaction and success. With this best-selling book's help, you'll discover your personality type and the 50 best jobs that relate to it. Part I overviews how personality relates to careers. Part II features a self-assessment for determining you personality type: Realistic, Investigative, Artistic, Social, Enterprising or Conventional. Part III contains the best job lists, including the 50 best jobs overall for each personality type. Other lists for each personality type include the best-paying jobs, jobs with the highest projected growth, best jobs based on education lever, best part-time jobs, and best jobs for the self-employed - 145 best jobs lists in all. 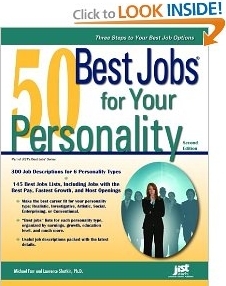 In Part IV, you find a gold mine of facts about the 50 best jobs for each of the six personality types and 300 job descriptions. As a bonus, 50 Best Jobs has a career assessment and an overview of the Holland Code Career Model. This is an excellent resource for counselors, consultants, and teachers."